Typically the length of the medical ID bracelet is a full length from end to end, when the bracelet is open and lays down. Our medical ID bracelet's length is measured as the circumference of the wrist bone plus half of an inch (1/2") to ensure comfortable wear. We suggest a couple ways how to measure length to make a proper order. Method 1. To determine your medical ID bracelet size, measure the wrist with a flexible tape measure just below the wrist bone, where you would place your Medical ID Bracelet. 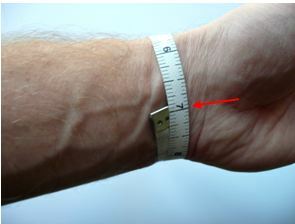 Take a true wrist measurement - not too tight or too loose. Now add to this amount 1/2"-inch. This is an approximate sizing.